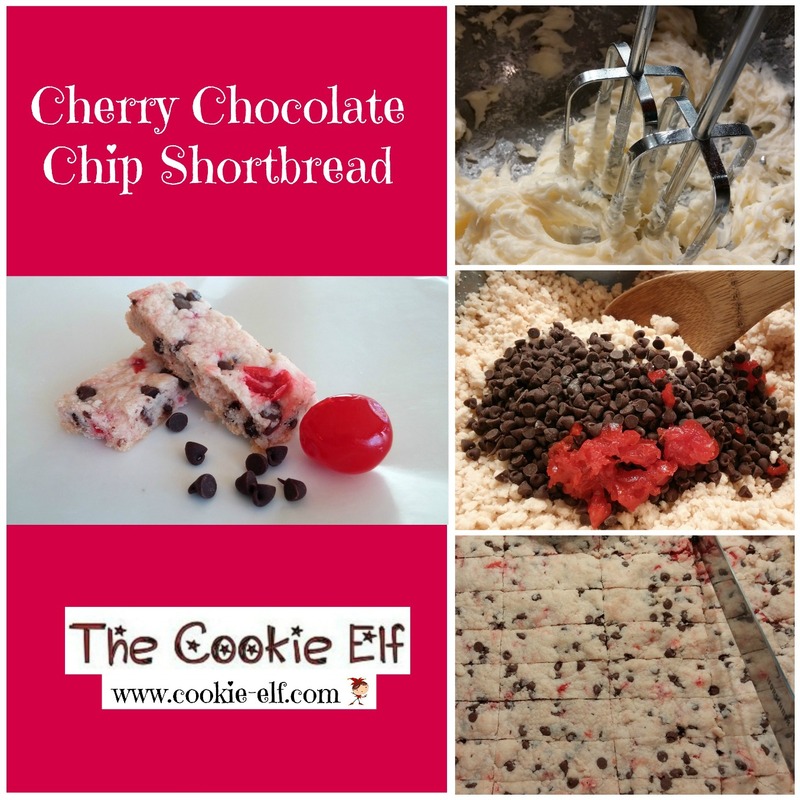 Cherry Chocolate Chip Shortbread: Just 7 Ingredients! Cherry Chocolate Chip Shortbread combines the rich, buttery texture of classic shortbread with two well-matched flavors: cherry and chocolate. And it’s so easy to make! Maraschino cherries are bright red, flavored with sweetener and almond flavoring, and processed in sugar syrup. Almond extract heightens the taste of the cherries. Paired with miniature chocolate chips, the combination with rich shortbread is unbeatable. The recipe deviates slightly from the traditional shortbread ingredient ratio of one part sugar, two parts butter, and three parts white flour. It calls for a larger amount of sugar than what is typical, albeit powdered sugar (rather than granulated sugar) which contains cornstarch. Preheat oven to 350º F. Line a 13 x 9 baking pan with parchment paper. Reduce speed to low. Add cherry juice and almond extract. Beat until fully combined, about 1-2 minutes. Gradually stir flour into creamed mixture a bit at a time until well blended, scraping the bowl constantly, until well mixed. Dough will be crumbly. Use a large spoon to stir in chopped cherries and miniature chocolate chips by hand. With floured fingertips, press dough into the prepared 13 x 9 baking pan. Bake shortbread 20-25 minutes just until the edges begin to brown. Remove baking pan from the oven. Use a sharp knife to cut shortbread immediately. Slice into thin bars, ¾ inch by 1 ½ inches. To remove bars from the pan, lift ends of parchment paper. Set shortbread on a cutting board or other flat surface. Store shortbread in an airtight container. Resist the temptation to use regular-sized semisweet chocolate chips in Chocolate Chip Shortbread. Tiny miniature chocolate chips distribute well throughout the dough so that they don’t alter the cookie texture yet are small enough to provide a bit of chocolate in every bite. Cut shortbread as soon as you remove it from the oven, while its surface is pliable and soft. If you wait until the shortbread sets, then edges will crumble. You can cut shortbread in ½ - 1 inch wide strips the length of the pan and then 1 -1 ½ inch bars width-wise.